Note: These splitters do not work like hubs; they must be used in pairs and you must have 2 ports available at your hub for each splitter pair used. Please refer to the illustration. - Please note: For 10Mbps (10BASE-T) networks only. Our CAT5 Y splitters let you connect 2 computers to 2 switch ports on your 10Mbps switch or hub through a single CAT5 patch cable. This is accomplished by utilizing a pair of normally unused wires found inside standard CAT5 Ethernet cables. It's like doubling a 10BASE-T network connection without pulling a new cable! 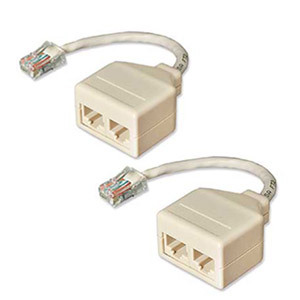 Used in pairs, one adapter combines two 10BASE-T data signals at the wall jack; both signals are carried through one CAT5 network cable and a second adapter separates the signals allowing two connections at your 10Mbps hub or switch.